ARNOLD 'Homestead' HAWTHORN - a small, dense tree native to the Northeastern United States reaching a height of 14-20 feet. 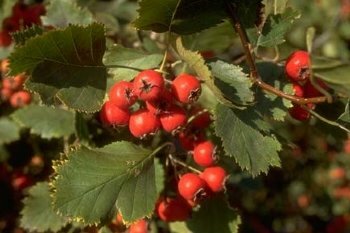 White flower culsters are followed by attractive bright red non-persistent fruit and twiggy, zigzag growth with thorns. Excellent non-suckering small tree. Also found listed as Crataegus mollis arnoldiana by some authors. Cultivar -'Homestead'- a USDA, Bismarck, N.D. PMC seed propagated selection."